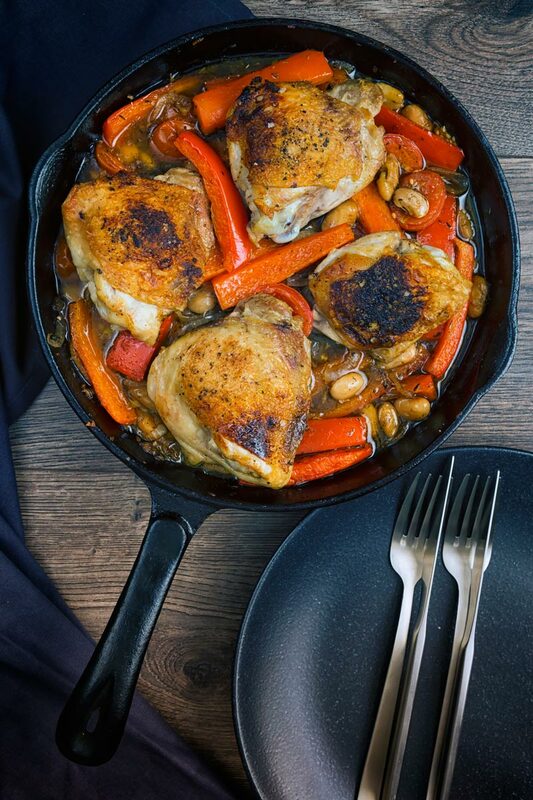 A chicken stew loaded with red peppers and beans and flavoured with Balsamic vinegar all cooked in one pot or skillet making it the perfect midweek dinner. Red Pepper and Bean Chicken Stew. Chicken thighs are no stranger here on my site and this chicken stew has them right at the centre. They are by some distance the tastiest part of the chicken and interestingly among the cheapest! Rather than being braised in the sauce as the chicken thighs are in my recent chicken hotpot recipe they are roasted sat on top of the stew. This means that the skin stays wonderfully crispy but the juice drip into the stew ensuring we lose none of the flavour. Whilst we are on the stew I have gone with red peppers and beans. These are flavoured with balsamic vinegar, garlic and thyme. Most importantly it is all cooked in the same pot, chucked in the oven and left alone. Should You Debone Chicken Thigh? For me, the answer to this often asked question is ‘not unless you have to’! Sure if you are cooking my Chicken korma or General Tso’s Chicken then of course you need to remove the bone. There are also sorts of ‘analytical tests’ that say it make no difference. But for me it does, the connective tissue and gristle break down and add to any sauce. This is, in the same way, it does when making stock. I also usually find them juicier, the bone acts as an insulator slowing the rate of cook. 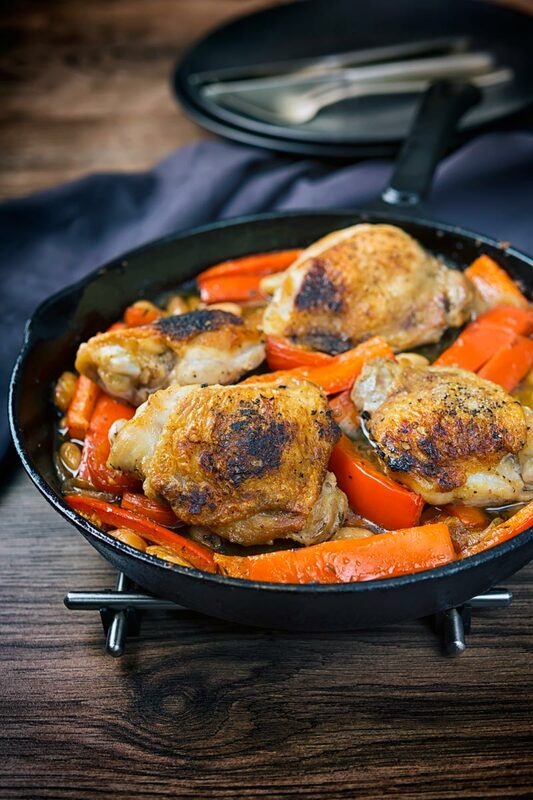 This means that the chicken thighs in this chicken stew are less likely to dry out. 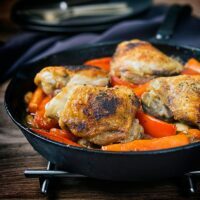 I strongly favour a cast iron skillet for this chicken stew recipe, but you can cook it in any heavy based shallow pan. Cast iron distributes heat beautifully, so for a stew like this it is great at keeping food warm. I like cooking in cast iron for a number of reasons, not least that they are indestructible. This pan has been part of my kitchen armoury for over 20 years! Yes, it is heavy, but I do not have any other pan that has been as used and abused as this. I use it on the oven, on induction hobs, it has been on gas and even the BBQ! It even got as rusty to buggery from misuse and poor storage one year. I scrubbed it back seasoned it up and it was as good as new. 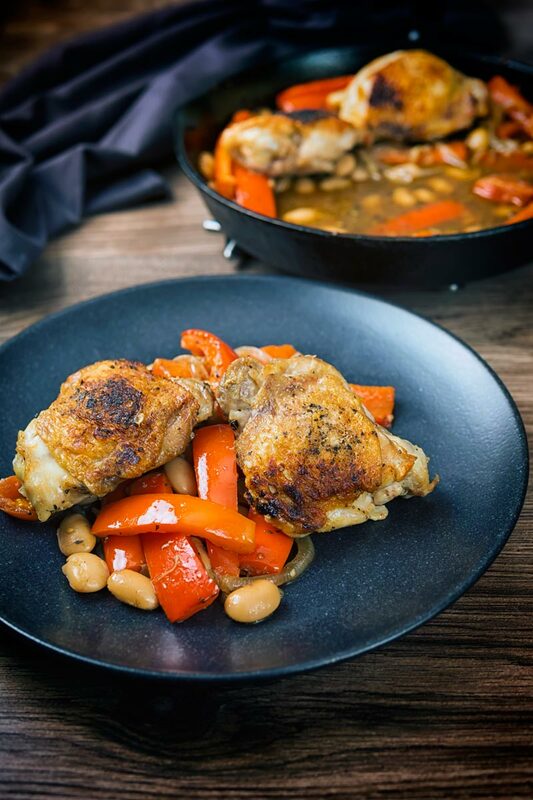 This one pot chicken stew is cooked in a cast iron skillet and is loaded with red peppers, white beans and simple Italian influenced flavours! Peel and slice your onion into thin half moon shapes. Cut your red pepper into 1cm strips. 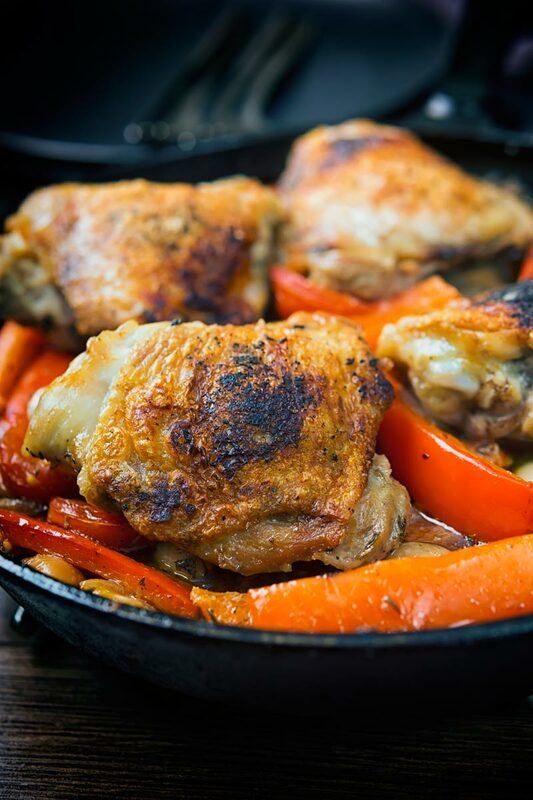 Heat a cast iron skillet or heavy based pan over a medium high heat and when hot add the oil. Place the chicken thighs skin side down in the pan and sear to get a nice golden colour. When they are seared remove from the pan and set aside. Add the onions and cook for 2-3 minutes followed by the garlic and cook for another 60 seconds. Add in the peppers, beans and tomatoes along with the thyme and stir. Pour over the balsamic vinegar, stir to combine and nestle in the chicken thighs and transfer to the oven. Bake for 35-40 minutes at 180°C 350°F. This is the perfect comfort dish! Perfect for this frigid weather that we are having, as of late! I just happen to have all of the ingredients too! This sounds so tasty and comforting. I’ve made a dish in similar style with the chicken perched on top of the veg and agree it works out so well to get all the great flavors but crisp skin as well. Looks like a tasty one pot meal. Thanks Caroline it is such a fab and simple way of cooking! Such a simple yet delicious recipe. Thanks for sharing! This looks incredibly tasty Brian. I love the colours and the beans addition. Just perfect for this time of the year and not only. I am definitely a cast iron advocate it definitely adds to flavour. Delicious dish, thank you for sharing.